Hetty de Wette was born in Huizen, the Netherlands, but grew up in Austin, Texas, after emigrating to the United States with her family at the age of 5. At age 20, she returned to the Netherlands to study under Diererik Kraaijpoel and Piet Pijn at the Royal Art Academy Minerva in Groningen. 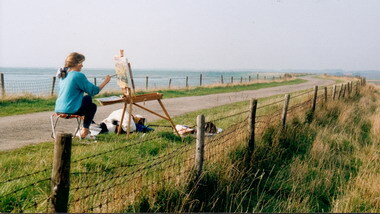 She now paints coastal landscapes on Schouwen Duiveland, a North Sea island in the south of the Netherlands, where she lives with her husband Bruce Kuhn and their two children. 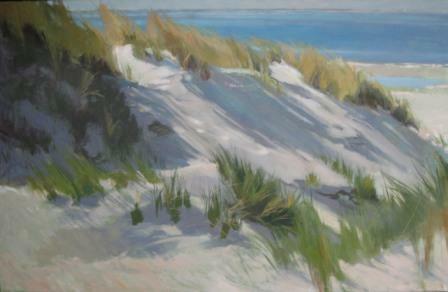 I walk the beaches, dunes and dikes of the island, easel and canvas strapped to a backpacking frame, painting in one place then moving to another as the light changes. Many artists paint from photographs, but the impressionists were fascinated with how real light hits the eye at a given moment. A painting requires me to return to its location again and again, at the same time of day, to finish it. Two hours is the limit before the light changes too much, then on to the next place. Getting to the locations can take almost as much time as actual painting, but it is worth it. North Sea weather is fickle; if I miss my window, it could be a year before the light is the same again. Most work is done in oil on canvas. I may use acrylics off-island, if travel demands forbid me to linger. What do I want to achieve with my work? Practically speaking … an income for the family! The complexity and infinite variations of organic form continue to inspire me. I want to express my fascination with light and my love of the landscape. What do I hope to achieve? A more energetic and intense rendering of what moves me. Concentration is my greatest challenge. 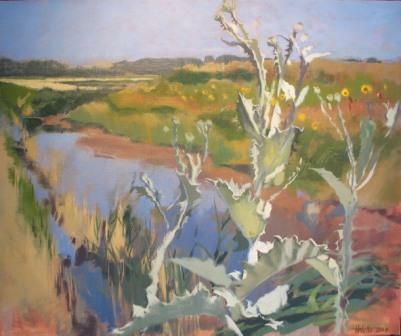 An artist (this one, anyway) needs quiet, lack of rush, a meditative lifestyle in order to be still and receptive enough to “see” in the full sense of the word. Today’s information age and rushed lifestyle is so counter productive to concentrated, quiet work. C.S. Lewis in his essay ‘The Weight of Glory’ talks about our ‘lifelong nostalgia’ for beauty, which we not only want to see but ‘pass into, receive into ourselves, bathe in, become part of’. This ‘chasm that yawns between us and reality’ seems to me to be the indefinable area that art is often searching out. In contrast to the current concepts of fragmentation, alienation and meaninglessness, I believe in a Creator who gives order, beauty and purpose to the world He made. This belief is the foundation of who I am and therefore of my work. 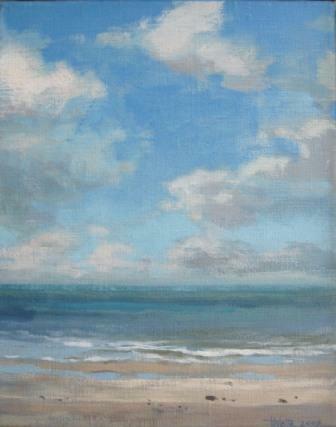 My work is sold primarily from my studio, as I have been able to build up a steady clientèle.